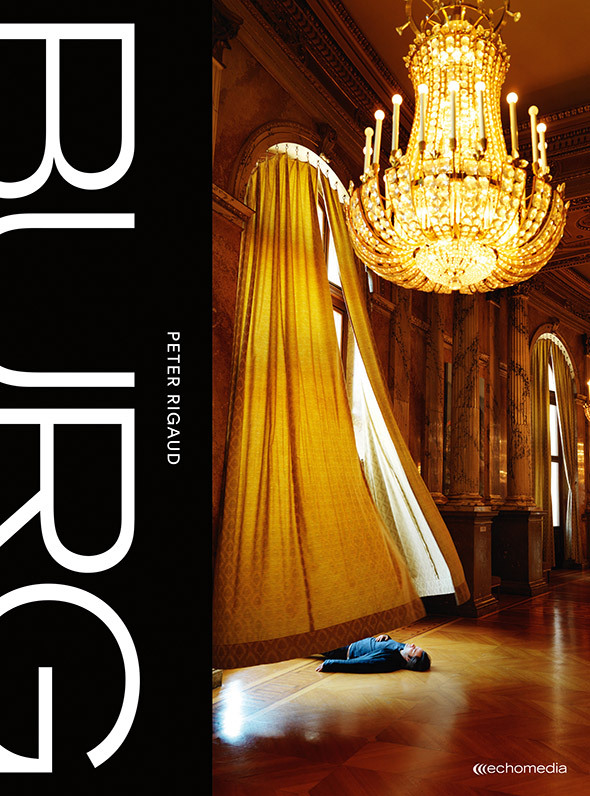 On the occasion of the recent release of »Burg«, a captivating book exploring Vienna’s iconic Burgtheater and its crew, we sat down with renowned photographer Peter Rigaud to talk about the challenging project and his practice in general. Born in Austria and based in Berlin, Peter Rigaud has made a name for himself mainly with his powerful portraits, photographing artists, politicians, musicians, football trainers, and supermodels all around the globe. 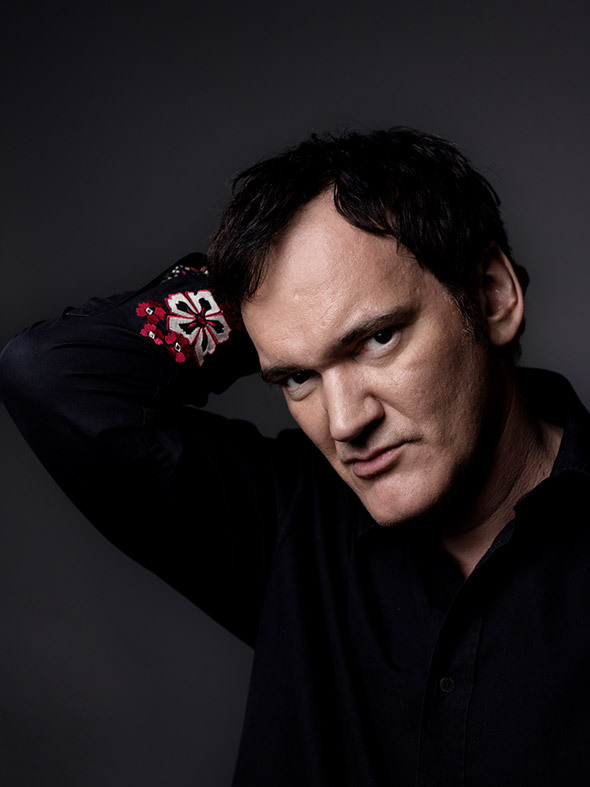 Marina Abramovic, Isabelle Huppert, Angela Merkel, Quentin Tarantino – he’s had them all in front of his camera. For his most recent book “Burg”, published by Echomedia a couple of months ago, he returned to his native Vienna to aim his lens at the city’s theatre, the iconic Burgtheater. The result is a captivating mix of architecture and portrait photography, presenting the historic building from completely new perspectives while letting the reader get a glimpse behind the scenes. Plus, the book does have a few surprises in store, such as actor Fabian Krüger, who’s pictured with his pants down. Others are shown walking on the roof or hanging from a coatrack like a piece of clothing. 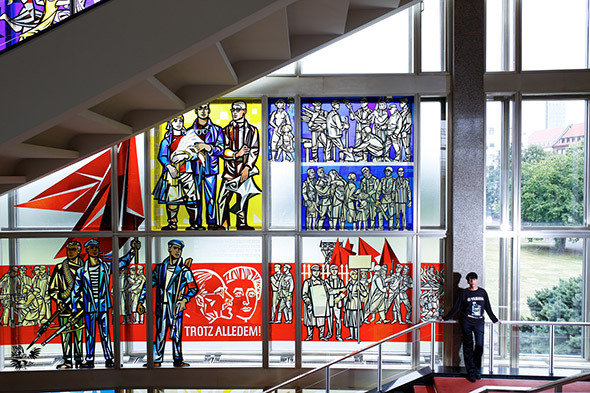 All 70 members of the cast could choose where they wanted to be photographed, taking us to unexpected spots like the basement or the elevator. Rigaud’s images spice up a subject that could easily have turned boring while always doing justice to the majestic atmosphere of the edifice, effortlessly bringing together stunning architectural shots with strong portraits that somehow seem to catch both the theatre’s past and present. We had a chat with Rigaud about this challenging project, what makes a great portrait, and how to crack hard nuts. Your agency describes you as a portrait photographer – is this your favorite field of work? What is it that drew you to it? Portrait photography is such an exciting discipline. I realized very early, when I was still at school, that this is what I wanted to do. I like the exchange that you have with people, and I can say that although I’ve been doing this for about 20 years now, no shoot is like another. You need to find a way to connect with the other person, understand how they work, how you can reach them, to be able to look behind the mask. How do you do that? Are there certain techniques to achieve that? First and foremost, it’s intuition, and you need to be well prepared. You just kind of need to see what happens, and experience plays a big role, too. It can be difficult at times; some people are hard nuts to crack. And then there are those who I would call a gift for every photographer, who are open to the experience and where everything just works naturally. You can compare it with personal relationships – sometimes it just clicks, and sometimes it doesn’t. How do you crack those hard nuts? You need empathy and to try out different things. It’s really interesting: sometimes you can decide to show that you were only able to touch the surface, at other times you picture someone’s insecurity in front of the camera, which also reveals something powerful about him or her. What makes a good portrait for you? I like images with a certain tension, a touch of mystery. It’s not about beauty. Is it easier to photograph a celebrity because they’re used to it, or more difficult because of the star factor? Clichés or airs and graces are something you can play with. Over the years, I came to realize that it doesn’t matter if someone is famous or not. Some people just attract the camera, others don’t. Some of your portraits are rather classical, like Joachim Löw, but then you have some more daring stuff, like Jamie Cullum who you show poking through a paper wall. How do these things develop? Do you always have a concept beforehand? I wanted to show Joachim Löw in front of this classic grey background because we usually always see him with a ball. I wanted to take him out of his environment as a tool to break through to him as a person. Of course, I think about what could work beforehand, but sometimes you prepare these amazing ideas and then the respective person doesn’t like them, which can be difficult. So then you need to quickly come up with an alternative strategy. You need to be able to deal with the circumstances you’re given. It’s not that great an achievement to just carry out your plans regardless – when they fall apart, that’s where it gets interesting. Let’s talk about your new book. 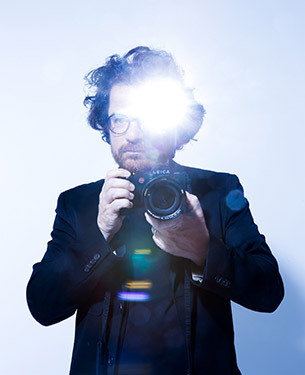 What was it like to photograph the actors of the Burgtheater? Fascinating. When it comes to actors, you might think that they know exactly what to do in front of a camera. But it’s really a mystery to me how someone who gives everything on stage and communicates feelings to an audience of 5000 people turns into someone shy and introverted when faced with a camera in a one-on-one situation. That’s a highly interesting phenomenon. But in the end, they’re just people like you and me, and they have to try to open up to the camera. That’s the essence of portrait photography: to make the subject open up to you. How did you approach the whole project? What were the biggest challenges? It was quite a challenge logistically; I had to make around 100 portraits while photographically calibrating the building from the basement to the roof. It was a lot of fun. Every portrait session took about an hour and a half. The original idea was to show the actors in their environment but not on stage. I also decided during the shoots to make a few close-ups to have a safety net of sorts. Of course I have to ask you about the pants-down portrait. How did that happen? These things happen again and again when you don’t even really understand yourself where this dynamic comes from. It’s a gift for every photographer. If I had approached him with the idea of pulling his pants down, it would not have worked at all. The idea would have become a corset. You’ve been in the business for quite a while now. Do you feel like it’s easier or more difficult to make it as a photographer these days? A lot has changed with digitalization, social media… anyone can call himself a photographer now. How do you feel about all that? I think photography is about freezing time, and photographs usually have certain codes that reveal from what time they’re from. I’m skeptical about how that will work in the future. You need more for that than selfies. But then Instagram, for example, is an important part of our society, and it will definitely be interesting to look back on it in 30 years’ time. Regarding education: if you look at the bios of famous photographers of the 20th century, lots of them didn’t study photography. Take Man Ray, for example. The technical side is easy to learn, and it’s actually a discipline that’s perfect for self-taught career changers. Any tips for young, aspiring photographers? You need passion, as with everything. Basically, you should be obsessed with photography. And you need to be interested in people and what they do. What does it mean to be a politician, an actor? Photography is a multifaceted communication tool, a language. You need to find out what your trigger is: Advertising? Journalism? Showing your work in exhibitions? The photographic language has expanded a lot over the years.